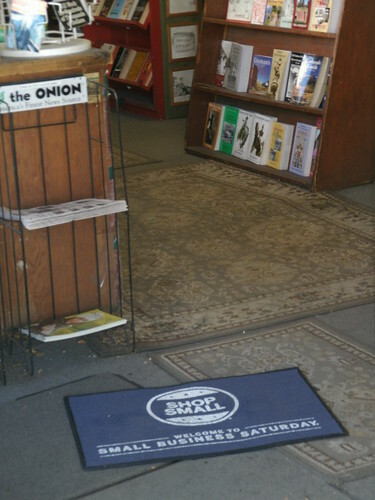 We’ve put out our welcome mat for customers who want to support our small business. You don’t last more than 30 years as a small business without the support of thousands of customers over that time. We know that there are a lot of people out there who drive past the Wal-mart and log off of Amazon and instead support real businesses in their communities. And we just want to thank those people. As always, we offer low prices and friendly customer service. We also try to be one of those interesting, eclectic businesses that just don’t exist online or at the big-box. That’s why we greet our customers with a Godzilla, provide staff recommendations for books, offer hand-lettered gift certificates by our resident calligrapher, select a thoughtful assortment of interesting postcards and gifts. We basically do everything a bit differently here and we’re glad a lot of people seem to appreciate that. So this holiday season consider choosing those cool, local businesses in your community. All of us will certainly welcome your support. This entry was posted in Uncategorized and tagged books, Bookstores in Denver., Capitol Hill Books, Denver, Denver bookstores, holiday shopping, small business, Small Business Saturday, weird. Bookmark the permalink.